The skull of Fedexia, which is 11.5 centimetres (5 inches) long, was uncovered in 2004 from 300 million year old rocks from the Late Pennsylvanian Period. 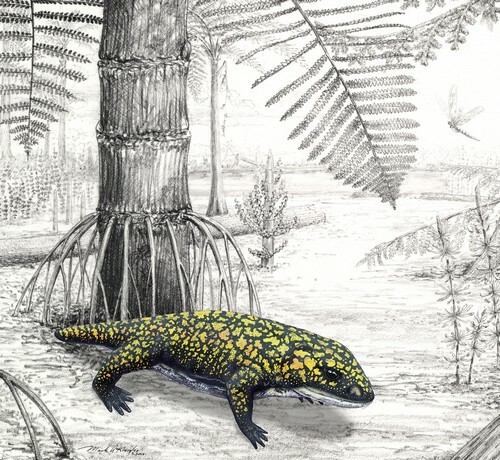 Very few other large amphibians from this period show signs of terrestrial life. The specimen shows remarkable preservation – having not been squashed by rocks deposited above it, the skull is still three-dimensional – to the extent that even the stapes (the middle ear bone) has remained complete and in its original position. The condition of Fedexia made it easy to identify the specimen as being a trematopid; the skull has a partially split, elongate, nasal opening – which is characteristic of this group. It is believed that this feature most likely granted some advantage for terrestrial life, such as a gland to remove excess salt, or to improve the creatures sense of smell. Trematopids lived around 70 million yeas before the advent of the dinosaurs, and form the first vertebrate life in North America to be adapted for life primarily on land – it is believed that they may have only returned to the water to mate or lay eggs. Fedexia striegeli in the environment of the Pennsylvanian Period. Photo credit - Mark A. Klingler/Carnegie Museum of Natural History. 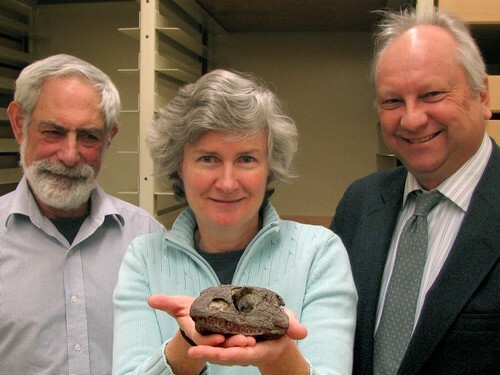 It is thought that the success of this group may have been a product of a global trend towards warmer climates that reached its peak near the end of the Pennsylvanian Period. At this time, often called the “Age of Amphibians”, moist conditions found at the equator, where Western Pennsylvania was located at this time, proved highly conducive to amphibian development. Subsequent shifts to a more semi-arid climate with more land exposed by falling sea levels, brought on by the growth of the polar ice sheets, would force amphibians to move onto the land and diversify in the new environment. “The one-to-one correspondence between this early appearance of trematopids in the fossil record and the preservation of dry climate indicators in the surrounding rock units suggests that this is a climatically driven immigration and/or origination event,” said co-author on the paper, David Brezinski. The creature gets its name from the University of Pittsburgh geology student who discovered it, Adam Striegel, and the FedEx Corporation, on whose land it was found.